I come from a family of immigrants, but I was born outside of Chicago in 1994. My mother was born in the Philippines, and immigrated to the United States in 1989. My father grew up on the south side of Chicago to a first-generation Spanish mother, and a Mexican immigrant father. My grandfather, Gerardo, was born in a town called Monterrey, in Nuevo León, Mexico. He moved to the United States in 1953 at the age of 21. Coming from such a blended background, and approaching 50, my father wanted to verify the ethnicity he’d always been told he was. So, he decided to take a DNA test, and send it off to Ancestry.com. He wondered if he would be like those people he’d seen on TV who grew up thinking they were one thing, but found out they were another. In July of 2017, my dad was helping me move into my New York City apartment when he got an email alert from Ancestry.com. His DNA results were in, and we were excited to explore our family’s roots. Little did we know, after that day, our family tree would change forever. The results provided the expected 22% Native Mexican and 36% Iberian Peninsula; a.k.a. Spanish. But there was a notification he didn’t quite understand. At the top of the site was a notification on the DNA Match page, then came the unexpected: His DNA had a “close relative match.” Her name, we learned, is Rochelle. Since most of my paternal grandfather’s family still lives in Mexico, and we have lost touch with many of them since immigrating to the U.S., we initially thought Rochelle may have been a distant Mexican cousin. My dad was curious, but decided he would deal with the match after we finished moving my things into my NYC apartment. A couple of days later, as my dad was in the airport waiting for his flight back to Chicago, he saw that he had a message on Ancestry.com. It was from Rochelle. “Hi Edward, I saw your Ancestry DNA come up as a Close Family Match,” Rochelle wrote, then went into a brief introduction about herself. At the time, Rochelle was 62 years old. She explained she was born in Chicago in 1955, and that she hoped my dad could help figure out their connection. Hearing that Rochelle was born in Chicago made my dad believe that she was actually a lost cousin from his mother’s side. Being so new to Ancestry.com, my dad didn’t know how to read the data. Everything was labeled in centimorgans -- a unit for measuring genetic linkage -- and broken up into categories of potential relation. Rochelle was not a first cousin once removed -- she was my dad’s half-sister. The half-siblings spent the next few months emailing one another about themselves. We learned Rochelle, now 63 years old, was put up for adoption at birth, and grew up in Brooklyn, just miles away from where I live now. When she was five years old, she found out she was adopted, but she only found out her birth mother’s name when her adoptive parents passed away. For the next 23 years, however, Rochelle had no idea who her birth father was. The “father” line of her birth certificate read three first names, and then “steel mill worker.” She spent years searching for any blood relatives through Ancestry, and GEDmatch. She even spent hours in libraries searching, but without our last name, she had only hit dead ends. It's because of this that my family believes no one knew my grandfather had fathered Rochelle, including my grandfather. 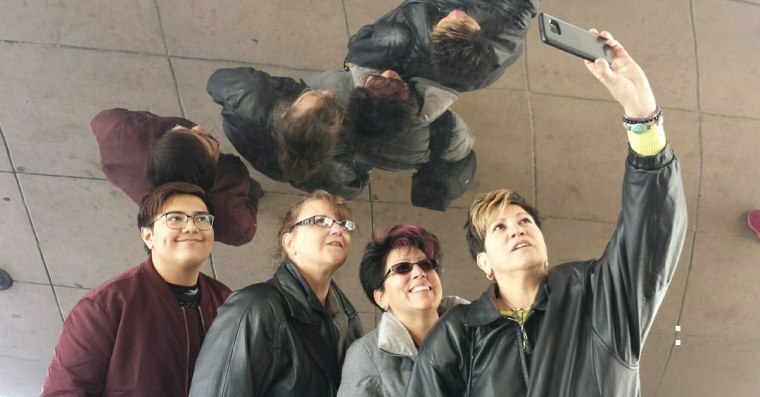 Members of the family meet Rochelle for the first time in Chicago, Illinois. From left to right: Daniel, Rochelle, Annette and Becky. After more than a year with no matches on Ancestry.com, Rochelle was going to let her membership lapse, but she got a gut feeling to renew it for just one more month. Halfway through that final month, my dad submitted his DNA, and Rochelle got her match. In addition to meeting a blood relative, Rochelle was finally able to learn about who her birth father was: Gerardo, my grandfather. Gerardo was an immigrant from Mexico, a welder, and the father of four other children. Gerardo loved birdwatching and his Rottweiler, Zeus. Sadly for Rochelle, the father she’d tried so long to find, died in 2008. Gerardo was 73 years old. Rochelle wasn’t the only one whose world had been turned upside down: My family had a lot to learn about her, too. Rochelle, we learned, is the mother of two, and now lives in Florida. She used to be a medical transcriber, but is now retired. To say our family was shocked would be an understatement. No one had any idea another branch of the family tree was out there. My aunts didn’t even believe the story until they saw a picture of Rochelle, and saw the family resemblance. This story was already full of coincidences, but there was one more to this story. As the story of Rochelle and her connection to my family was coming into focus, I happened to be assigned to Sunday's story. A story about a woman who took a DNA test and found a half-sister no one in her family had known about, including her father. In April, Rochelle came back to Chicago to meet her half-siblings for the first time. I wasn’t there for the reunion, but my dad says she fit right in. It felt like they’d known her their whole lives.